Is YOUR communications center atmosphere toxic? Do YOU feel under-appreciated? Is ANYONE listening when you make suggestions? Participants in this session will discuss what makes our communications center environments toxic.Telecommunicators play an important role in the atmosphere in which they work in.Session participants will explore how it is them that actually hold the key to influence the difference within their communications center and in their careers. Attendees will re-examine their communications center environment and review their agencies expectations and the public expectations of them. Attendees will identify and define what a team player is and how it relates to team work in the communications center environment. Attendees will be introduced to the FISH Philosophy and learn the four components of Play, Make their Day, Be There and Choose Your Attitude. Jeryl Anderson has been a Telecommunicator for over twenty-five years. She is currently employed at Orange County Emergency Services, as the Special Initiatives Officer.Jeryl has been a certified instructor since the 1990’s and has vast experience in class room presentation to include, but not limited to, curriculum and testing development and on-line course development and implementation.Jeryl is proud to have been at the beginning of the Telecommunicator Certification Course for North Carolina Telecommunicators, during her time as a Criminal Justice Instructor Coordinator with the NC Justice Academy, where for eleven years, she taught, edited, and implemented the curriculum across the state of North Carolina. Jeryl is an experienced online instructor, conference speaker and event coordinator. Jeryl is an RPL through APCO and an ENP through NENA. 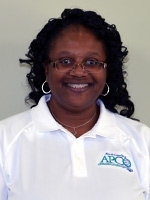 Jeryl serves APCO Institute by being one of their Adjunct Instructors.She is currently serving on the NC APCO Executive Board as their First Vice President, while also serving the NC Chapter as one of the chapter Training Coordinators. On a personal note, Jeryl still considers herself a newlywed and enjoys spending time with her new spouse, Kevin Anderson.Jeryl is also a dedicated Girl Scout Troop leader and serves as the Durham Service Unit 215, Area 11 Manager for NC Coastal Pines Girl Scout Council.